The ship has already sailed in the global race to export liquefied natural gas to Asia, according to U.S. energy economist Kenneth Medlock — and Canada has missed it. Medlock was a keynote speaker at the Canadian Energy Research Institute's annual conference on natural gas. This year the conference was called LNG: Canada's Last Window of Opportunity. The anxiety is well-founded, according to Medlock. "We don't see any LNG exports from Canada until almost 2040," he said in an interview. Medlock expects almost all new LNG supply to come from the United States or Australia. The largest issue is cost. Canadian projects are greenfield, meaning they are being built from scratch. In the U.S., multiple projects are conversions of existing LNG import terminals that already have ports built and pipelines attached. They simply need to be converted so they can export instead of import. "The fixed cost to get them finished is relatively low," said Medlock. "That serves a distinct advantage." The Diamond Cove LNG facility in Maryland will come online years before any Canadian project. Medlock expects four of those terminals, including Maryland's Diamond Cove, pictured above, to come online soon, as well as several Australian projects. "That's going to cause a lot of softness in the market and cause a lot of developers to put the brakes on things. "That's the capacity that's coming — it's already steel on the ground, so it's happening — and the market is just not going to be substantial enough to absorb it all in a very short period of time. It's a classic boom-bust cycle." Once that capacity comes online, Medlock expects, Asian LNG prices will drop to the point where Canadian facilities are no longer viable. Because international prices for LNG are linked to the price of oil, they have come down considerably since August. As you can see from the chart above, the Japanese benchmark was trading close to $15 US per million British thermal units (MBTUs) to under $7 US. That's not enough to make shipping LNG from North America profitable for anyone right now. Peter Howard, president emeritus of the Canadian Energy Research Institute​, said he's done the same math as Medlock but come to a different conclusion, as long as oil prices recover to $70 US per barrel. "We took into account the Qatari gas and all the Australian projects that are under construction or completed construction," said Howard. "We added into that the Gulf of Mexico and that left room in 2020-23 for two additional projects, which we think are the West Coast projects." Howard said that also assumes that Japan would bring most of its nuclear power industry back online soon, something that he said seems increasingly unlikely. Most of Japan's nuclear plants have been disabled since the Fukushima reactor meltdown in 2011. If they remain out of commission, Japan will depend more on fossil fuels such as natural gas. According to the B.C. government, there are 19 proposed LNG projects. Many have been granted export licences, but none have made the final investment decision. That comes from the board of directors of each company, a decision to spend tens of billions of dollars on a project. It's not an easy decision to make, especially with oil prices on the skids. Malaysia's Petronas has delayed its final investment decision on its $36-billion project. Chevron has slowed spending on its project in Kitimat. 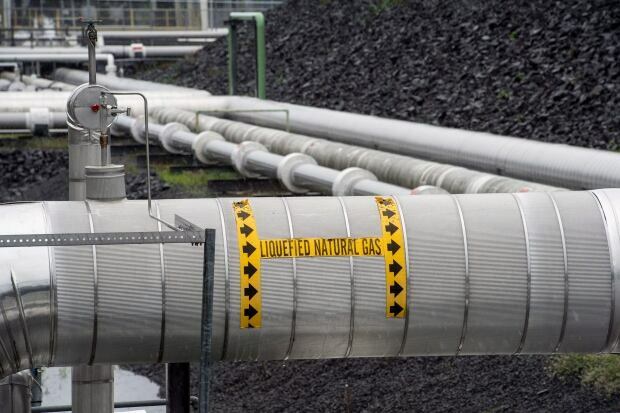 Shell is hoping to have a decision this summer on its $40-billion Kitimat project. In mid-February, the federal government helped things along, by announcing a tax break for the proposed LNG facilities, allowing them to write down their multibillion-dollar investments more quickly. That was a key piece of the investment puzzle. The other piece of the puzzle is the price of oil, which is expected to start recovering later this year, according to Judith Dwarkin, chief energy economist at ITG Investment Research in Calgary. Dwarkin agreed with Medlock's general argument that Canadian projects face headwinds, particularly around how much they cost. But she said the projects shouldn't be counted out. "I would hesitate dismissing completely the possibility of any Canadian LNG plying the waves in the next 25 years," said Dwarkin. "There are price scenarios and tolling agreements that conceivably could make sense. And Asian buyers supposedly value diversity of supply, a box Canadian LNG checks off."